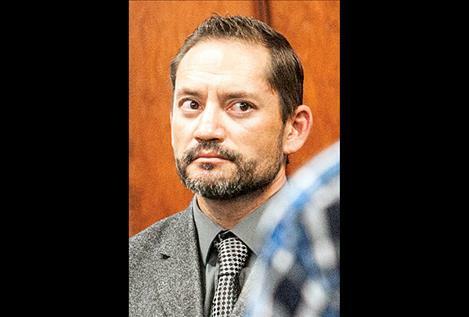 A former Polson property manager was committed in District Court at Polson on March 18 to a total of eight years with the Montana Department of Corrections on 16 counts of felony theft. Douglas Dennis Lichte, 42, was also sentenced to a total of 100 days in the Lake County jail on three misdemeanor counts of theft for which he was given 75 days credit at the time of sentencing. Lichte entered a guilty plea on Jan. 3 to 19 counts of theft. The guilty plea came without the benefit of a plea agreement, which put him at the mercy of the court. The maximum sentence for felony theft is ten years. District Judge Deborah “Kim” Christoper allowed for some leniency by committing Lichte to the DOC for 10 years on each count with all but six months suspended on each count to run consecutively. Christopher also ordered Lichte to pay restitution of $236,578.39, according to the minute entry in Lichte’s criminal file. Polson Police issued a warrant for Lichte’s arrest in March 2017 after receiving numerous complaints of tenants not being able to recover security deposits from their rental units. Lichte was picked up on a warrant about two days later after a routine traffic stop in Gallatin County. He posted $100,000 bond and appeared before Christopher on March 30, 2017. Christopher ordered Lichte to forfeit his passport during that appearance. After Lichte plead guilty on Jan. 3, he was remanded to the custody of the Lake County Sheriff. He has been in the Lake County jail since that time.